At this time of year, after all of the rich food of Christmas, lots of people decide to make more healthy eating choices but that doesn’t mean you can eat nothing but salads. If you come in to the restaurant or order delivery from Joy Raj, there’s every reason why you can still select curry as part of your weight loss and healthy eating New Year plans. Banish from your thoughts any ideas of the salt and sugar-packed, swimming-in-grease attempts at Indian cuisine that we have seen out there. At Joy Raj, our top chef prepares authentic fusions of exquisite Indian, Bangladeshi and Pakistani cuisines. All of the mouth-watering dishes on our menu are delicately spiced, delicious and healthy, especially if you opt for a fish curry, one of our house specialities, like Bengal Machli Jalfrezi — sumptuous fish fillets from the Bay of Bengal, cooked in a variety of fresh green chillies and lemon juice. It’s sharp, hot, healthy and delicious. There is tons of scientific research that proves adding more fish to your diet is a very healthy choice to make indeed. Fish are a great source of protein and provide essential oils like omega 3, which is good fat and lowers blood pressure and aids concentration, helps lower cholesterol and promotes heart health. Oily fish that work so well smoked and grilled with a crispy skin, also have particularly high amounts of omega-3, and some studies suggest that eating these fish helps to fight chronic diseases like diabetes and prevents heart disease, stroke and cancer, leading to a longer life. 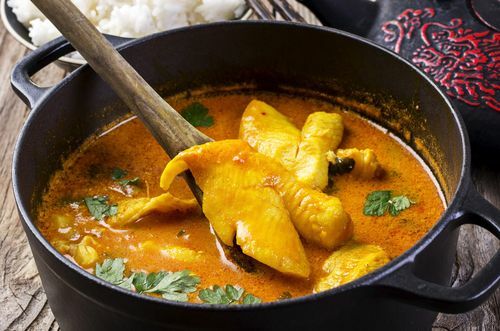 By choosing to eat a Joy Raj fish curry, you can increase your fish intake and enjoy more of these wonderful fish health benefits, plus the spices will help alleviate winter colds. According to the Daily Telegraph, ‘Researchers found fenugreek may stave off viruses that cause sniffles and sore throats, helping to relieve the symptoms. The results appeared to be conclusive, with volunteers reported immediate and sustained relief from symptoms of runny nose, cough, sneezing, sore throat, and tiredness.’ Other common spices cloves, chillies, cardamom oil and saffron are known expectorants i.e. they (excuse us) loosen phlegm in the same way that many over-the-counter cold and flu medicines contain a chemical to do. If you don’t have a cold or don’t fancy fish, no problem. At Joy Raj, we also have exquisite chicken, lamb, prawn and vegetable dishes available for you to enjoy in a relaxed friendly environment that’s fit for a king. We also deliver.